In January, 1996, exactly two years from the moment, when two Ph.D. candidates at Stanford University (Jerry Yang and David Filo) started their work on the project, which will became the now ubiquitous web portal Yahoo, two other graduates at Stanford—Larry Page and Sergey Brin, Stanford computer science graduate students, working on the Stanford Digital Library Project (to develop the enabling technologies for a single, integrated and universal digital library), began collaborating on a research project, which will evolve to the world-renowned web portal Google. Sergey Brin, was born in 1973 as Сергей Михайлович Брин in Moscow, Soviet Union, to Russian Jewish family, which moved to USA in 1979. In 1990 Brin enrolled in the University of Maryland, to study computer science and mathematics, where he received his Bachelor of Science degree in 1993 and began his graduate study in Computer Science at Stanford University on a graduate fellowship from the National Science Foundation. Lawrence "Larry" Page, was born in 1973 in East Lansing, Michigan, in a Jewish family of computer science professors at Michigan State University. He holds a Bachelor of Science degree in computer engineering from the University of Michigan and a Masters degree in Computer Science from Stanford University. In 1995, searching for a dissertation theme, Page considered (among other things) exploring the mathematical properties of the World Wide Web, understanding its link structure as a huge graph. His supervisor Terry Winograd encouraged him to pick this idea (which Page later recalled as the best advice I ever got) and Page focused on the problem of finding out which web pages link to a given page, considering the number and nature of such backlinks to be valuable information about that page (with the role of citations in academic publishing in mind). 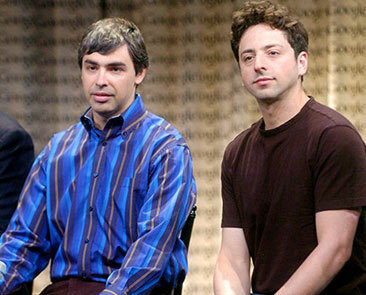 In his research project, nicknamed BackRub, Page was soon joined by Sergey Brin, a fellow Stanford Ph.D. student, who Page met in 1995. Page's web crawler began exploring the web in March 1996, setting out from Page's own Stanford home page as its only starting point. To convert the backlink data that it gathered into a measure of importance for a given web page, Brin and Page developed the PageRank algorithm. Analyzing BackRub's output, which for a given URL, consisted of a list of backlinks ranked by importance, it occurred to them that a search engine based on PageRank would produce better results than existing techniques (existing search engines at the time essentially ranked results according to how many times the search term appeared on a page). This was not an original invention, as a small search engine called Rankdex was already exploring a similar strategy. BackRub is written in Java and Python and runs on several Sun Ultras and Intel Pentiums boxes, running Linux. The primary database is kept on a Sun Ultra II with 28GB of disk storage. As the search engine grew in popularity at Stanford, installed on the Stanford website (domain name google.stanford.edu), both Page and Brin decided that BackRub needed a new name. Page turned to fellow graduate student Sean Anderson for help, and they discussed several possible new names. After several days of brainstorming in their graduate student office, Anderson verbally suggested the word googleplex (a googolplex is the number one followed by a googol zeros. The term googol was coined in 1938 by Milton Sirotta (1929–1980), nephew of American mathematician Edward Kasner). Page and Brin liked googleplex, but Page suggested they shorten it to googol. When Anderson searched to see if the domain name was available, he misspelled googol as google which was available. Because googol was unavailable and Page thought google had an Internet ring to it like Yahoo! or Amazon, Page registered their search engine as google.com on the Internet domain name registry. In contrast to other busy-looking pages with flashy banners and blinking lights, Brin and Page decided to keep google.com clean and simple to allow for faster searches. This appeared to be a wise decision. Though the Stanford Digital Library funded them $10000 which Brin and Page used to build and string together inexpensive PCs, they were still perpetually short on money. As google.com’s popularity continued to grow at Stanford, they were faced with a decision: finish their graduate work or create a business around their growing search engine. Reluctant to leave their studies, Page and Brin offered to sell their search engine for one million USD first to AltaVista search portal. To their disappointment however, AltaVista passed, as did Yahoo, Excite, and other search engines. They were rejected in part because many search engines wanted people to spend more time and money on their Web site, while Google was designed to give people fast answers to their questions by quickly sending them to relevant Web pages. Then Yahoo's cofounder David Filo, advised them to take a leave of absence from Stanford to start their own business. Filo initially encouraged Brin and Page not only because they were friends, but also because Yahoo was interested in cultivating a field of healthy search engines they could use. The domain google.com was registered on September 15, 1997. Page and Brin formally incorporated their company, Google Inc., on September 4, 1998 at a friend's garage in Menlo Park, California. Both Brin and Page had been against using advertising pop-ups in a search engine, or an "advertising funded search engines" model, and they wrote a research paper in 1998 on the topic while still students. However, they soon changed their minds on allowing simple text ads. By the end of 1998, Google had an index of about 60 million pages. The home page was still marked as "BETA", but some observers already argued that Google's search results were better than those of competitors like Hotbot or Excite.com, and praised it for being more technologically innovative than the overloaded portal sites (like Yahoo!, Excite.com, Lycos, Netscape's Netcenter, AOL.com and MSN.com), which at that time, during the growing dot-com bubble, were seen as "the future of the Web", especially by stock market investors. The Google search engine attracted a loyal following among the growing number of Internet users, who liked its simple design. In 2000, Google began selling advertisements associated with search keywords. The ads were text-based to maintain an uncluttered page design and to maximize page loading speed. Keywords were sold based on a combination of price bid and click-throughs, with bidding starting at $.05 per click. This was not a pioneering approach, as this model of selling keyword advertising was already used by Goto.com. While many of its dot-com rivals failed in the new Internet marketplace, Google quietly rose in stature while generating revenue. Today, many companies use Google to promote their products. Even yacht companies looking to sell used sea ray yachts for sale will use Google to attract buyers. Now Google runs over one million servers in data centers around the world, and processes over one billion search requests and twenty petabytes of user-generated data every single day. Google's rapid growth since its incorporation has triggered a chain of products, acquisitions and partnerships beyond the company's core product—the search engine. Google's offers online productivity software, such as its Gmail e-mail software, and social networking tools, including Orkut and, more recently, Google Buzz. Google's products extend to the desktop as well, with applications such as the web browser Google Chrome, the Picasa photo organization and editing software, and the Google Talk instant messaging application. Recently, Google created the Android mobile phone operating system (based on Linux), used on a number of GSM smartphones.